I hate finding that one product I love and having to run around like crazy to find it again. The Ology line from is a fantastic find. Available at Walgreens, Ology products are free of chemicals, dyes, artificial fragrances and are made from natural, sustainable materials. I can also pick them at 2:00 a.m. if I need to. 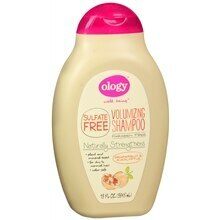 The product I’ve used is the Ology Volumizing Shampoo. My hair looks great and my skin doesn’t hurt. Here’s what many people don’t realize. My skin disorder is my my face, shoulder and side, so why does my shampoo matter? Because those suds go down your body in the shower and my shampoo can affect my skin. Ology has many other beauty products, including a baby care line, as well as household items. The next one I’m going to try is the laundry detergent.